, an eminent engraver, who, says lord Orford, “need but be mentioned, to put the public in mind of the several beautiful and fine works for which they are indebted to him,” was born in 1690. We have no account of his education, but, independent of his art, he appears to have been a scholar. His first engravings exhibited the splendid ceremonial of the installation of the knights of the bath in 1725. These were followed by his admirable prints, ten in number, representing the tapestry hangings in the House of Lords. These were so highly approved, that the parliament passed an act to secure the emolument arising from their publication to him. Tnese, with the letter-press, form a volume, “rivalling the splendid editions of the Louvre.” The order of the battle, and other circumstances relative to the memorable Spanish armada, are most accurately executed: the portraits of the admirals and captains of the English fleet are not the least valuable part of the whole. He engraved five other plates of the same size, to accompany them, being, 1. A Plan of the House of Peers; another of the House of Commons A View of the Creation of Charles Brandon, Duke of Suffolk, by Henry VIII. from a drawing in the College at Arms. 2. The House of Peers, with Henry VIII. 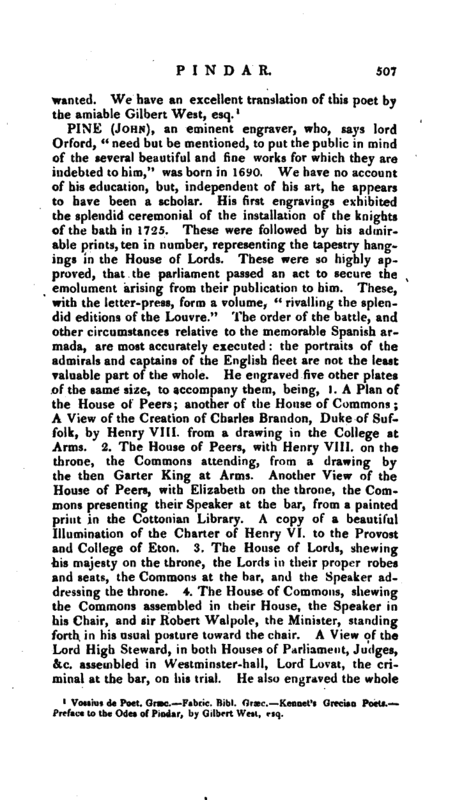 on the throne, the Commons attending, from a drawing by the then Garter King at Arms. Another View of the House of Peers, with Elizabeth on the throne, the Commons presenting their Speaker at t;he bar, from a painted print in the Cottonian Library. A copy of a beautiful Illumination of the Charter of Henry VI, to the Provost and College of Eton. 3. The House of Lords, shewing his majesty on the throne, the Lords in their proper robes and seats, the Commons at the bar, and the Speaker addressing the throne. 4. The House of Commons, shewing the Commons assembled in their House, the Speaker in his Chair, and sir Robert Walpole, the Minister, standing forth in his usual posture toward the chair. A View of the Lord High Steward, in both Houses of Parliament, Judges, &c. assembled in Westminster-hall, Lord Lovat, the crijmnal at the bar, on his trial. He also engraved the whole | text of Horace, illustrating it with ancient bas reliefs and gems, and in the same manner Virgil’s Bucolics and Georgics. These are his principal works, except his “Magna Charta:” one of the copies of which he presented to the Aldermen of London, who voted him a purse with twenty guineas in it. He, with Tinney and Bowles, published a large Plan of London and Westminster, with all their buildings, on a large scale, from an actual survey taken by John Rorque. Jn 1743 he was made Blue Mantle in the Heralds’ roiltge, and his Majtsty, George II. 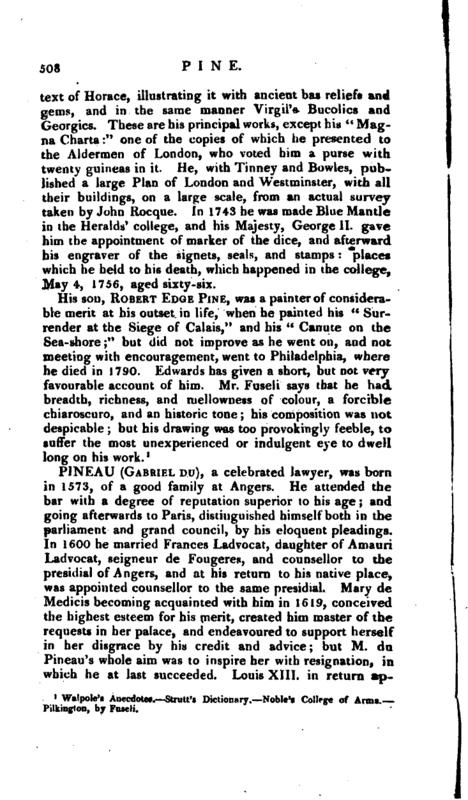 gave him thr appointment of marker of the dice, and afterward his engraver of the signets, seals, and stamps: places which he held to his death, which happened in the college, May 4, 1756, aged sixty-six. Walpole’s Anecdotes. —Strutt’s Dictionary. Noble’s College of Arras. Pilkington, by Fnseli.